A 53-year-old woman was found seriously injured and severely dehydrated after spending six days stranded in the Arizona Strip desert after a car accident. Arizona transportation worker Zach Moralez noticed a damaged fence and vehicle tracks off U.S. Highway 60. He says he hurried into the ditch, calling out if anyone could hear him. He got no response. 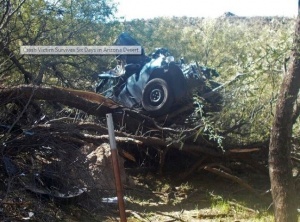 A mangled vehicle was found on top of a mesquite tree. The woman was curled up in a nearby dry river bed. She was able to answer questions and said she had stayed in the car for a few days after the accident before attempting to walk for help. Her survival was helped by relatively mild temperatures, ranging in the mid-50s to 80s.